Rescue the king from his nightmares. The Dreamwalker is lost in King Jorunn's nightmares. 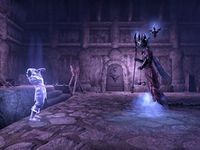 I must enter the Dreamstride and try to rescue both of them before the Daedric poison kills the King. Help the king escape the cave. Talk to King Jorunn in Mistwatch. The high priest says you must pray to the Three Old Gods. Each will help you, but in a different way. You will be facing the king's greatest fears and worst memories: the death of his sister, the soldiers in his service and Fildgor. You need to show the king that his soldiers gave their lives because they loved and believed in him. The Ternion Monks worship the three Old Gods: the Fox, the Bear and the Wolf. The Fox enhances your speed, the Bear enhances your strength and provides protection against overwhelming odds, and the Wolf will allow you to see your enemies' weaknesses. Praying at a totem sends you to Mistwatch Crevasse. The animal you choose will physically accompany you, even helping you defeat enemies. Pray at one of the three totems and accept the aid of the Aspect of the Wolf, Bear or Fox. The first area is an Ancient Nordic tomb filled with draugr. At the end of the tomb, you find the Dream Eater attacking King Jorunn. Defeat the Dream Eater to free a fragment of King Jorunn's soul. Use the door to return to Mistwatch and talk to the high priest. The king knows he is in danger, but this makes your task more difficult, as the dream will collapse if the king knows he is in danger. You need to be quick. You have to pray at a totem again. This part of Mistwatch Crevasse is cold and icy. 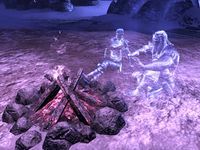 Talk to the Fractured Spirit of King Jorunn by the fire. This is the memory of a cave he and Nurnhilde fell into when hunting. They almost froze to death, but his sister saved them. However, he blacked out and never saw the exit. He remembers the fires were key. The spirit of the Fox is helpful for this trial. You need to run quickly from one fire to the next because you start to freeze if you are away from the fire for too long. The quest markers lead you to the next fire. New fires show memories of Nurnhilde and Jorunn. Southeast of the final fire, the Dream Eater holds another fragment of Jorunn's soul. Talk to the high priest again. The king's dreams will try to deceive him now. This time if you cannot convince the king what he sees is a lie he will die, and so will you. In the final dream, talk to Stormy-Eyes, the Dreamwalker. He says the king followed a pretty young woman up the steps, then specters appeared. At the top of the stairs, the Dream Eater has the final fragment of Jorunn's soul. Defeat him and talk to Jorunn. He doesn't quite remember you but agrees to leave. After you finish talking to him, Queen Nurnhilde's spirit appears and talks to her brother. She says Fildgor merged her spirit with his own, so he might be recognized as the rightful king. Return to Mistwatch and talk to the king, who is now standing up. Fildgor believes that with Nurnhilde's spirit he would be able to wear the Crown of Freydis, which won't fit on an unworthy head. If Fildgor is able to wear the crown, Jorunn will be unable to challenge him. He says Fildgor and some Stormfists went to the Skuldafn dragon shrine, so he and the prince will set up camp at the base of the mountain there to plan a counterattack. The first trial requires strength. I should pray to one of the three totems for guidance. Perhaps High Priest Esling can offer some advice before I choose. It appears the King's spirit has been fractured, broken into three parts. 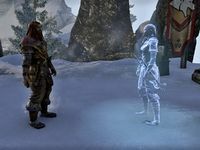 I must run the gauntlet of Jorunn's nightmare and set his spirit shard free. I set a shard of King Jorunn's fractured spirit free. I should leave this dark dream and talk to High Priest Esling. The second trial requires quickness. I should pray to one of the three totems for guidance. Perhaps High Priest Esling can offer some advice before I choose. The King's spirit has been fractured, broken into three parts. One of those shards waits for me inside this dream. I should speak to him. I need to stay close to the fires as I navigate this dream. Otherwise, the cold will sap my strength. I must run the gauntlet of Jorunn's nightmare and set the shard of his spirit free. I set the second shard of King Jorunn's fractured spirit free. I should leave this dark dream and talk to High Priest Esling. The third trial requires perception and observation. I should pray to one of the totems for guidance, one last time. Perhaps High Priest Esling can offer some advice before I choose. Stormy-Eyes is up ahead and he appears to be injured. I should speak to him and find out what's going on. The King's spirit has been fractured, and the final part remains a prisoner within his own dreams. I need to find it and set it free before it's too late. King Jorunn's fractured spirit has been freed and made whole again. I should speak to him before exiting his dream. Queen Nurnhilde appeared and explained Fildgor's plans. He wants to steal her spirit and prove that he's the rightful king. I should go through the portal and meet King Jorunn back in the waking world. King Jorunn is awake. I should speak to him. Finishes quest Jorunn the Skald-King is awake. I should speak to him. This page was last modified on 21 April 2019, at 21:50.